Aric Almirola, driver of the No. 10 Smithfield Bacon For Life Ford for Stewart-Haas Racing, celebrates in Victory Lane after winning 1000Bulbs.com 500 at Talladega Superspeedway. Almirola stayed up front with his teammates all race and was in position to take the lead on the final lap and earn his first victory with Stewart-Haas Racing. Stewart-Haas Racing led 154 of the 193 laps in Sunday’s 1000Bulbs.com 500 at Talladega Superspeedway. Aric Almirola led the most important of those — the last one. The four Stewart-Haas Fords stayed up front for the vast majority of the race, most of the time running in order. Almirola, driver of the No. 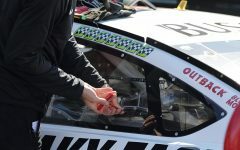 10 SmithField Bacon For Life Ford, stayed patient through the first two stages scoring a fourth place finish in Stage 1 and Stage 2 behind his three teammates, but his time came in the last stage and he was able to record his first win with Stewart-Haas Racing, and the second of his career. Clint Bowyer, driver of the No. 14 Cummins/Rush Ford for Stewart-Haas Racing, took home the runner-up position after finishing second in both Stage 1 and 2. Finishing third was Ricky Stenhouse Jr., driver of the No. 17 SunnyD Ford for Roush-Fenway Racing. Stenhouse Jr. had a tremendous rebound in the final segment of the race following a 32nd place finish in Stage 2. Denny Hamlin, driver of the No. 11 FedEx Toyota for Joe Gibbs Racing, came in fourth. Hamlin was the only Joe Gibbs driver who was able to find consistent speed and run up front the entire race. Completing the top five was Joey Logano, operator of the No. 22 Shell Pennzoil Ford for Team Penske. The Penske drivers tried to employ teamwork to compete against Stewart-Haas Racing, but struggled to find as much success. In the final laps of the race, many drivers started running out of fuel after making their last pit stops all the way back on lap 147. 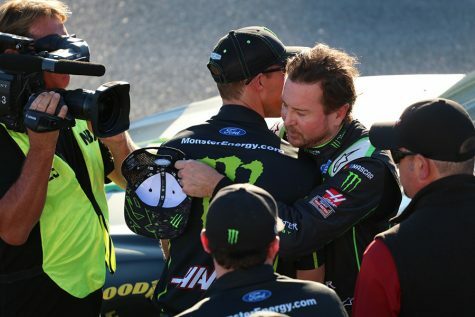 This included Kurt Busch, winner of the pole and Stage 1 and driver of the No. 41 Monster Energy Ford for Stewart-Haas, who led over half the race with 108 laps out front. Busch’s teammate, Kevin Harvick, driver of the No. 4 Jimmy John’s Ford, also ran out of gas and was forced to pit after winning Stage 2. More detrimental to championship hopes was when Team Penske drivers, Ryan Blaney, driver of the No. 12 Rev Ford, and Brad Keselowski, driver of the No. 2 Miller Lite Ford, ran out of fuel before they could compete for the win. The incident left Blaney 22 points below the cutoff to advance to the next round of the playoffs and Keselowski 18 points out. 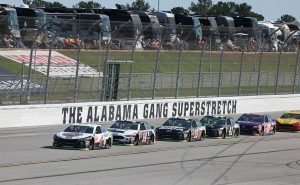 The four Stewart-Haas Racing drivers lead the field down the Alabama Gang Backstretch at Talladega Superspeedway. This was the sight for the majority of the 1000Bulbs.com 500 as Stewart-Haas Racing drivers led 154 of 193 laps throughout the race. In the first stage of the race, no one could touch the Stewart-Haas drivers. On the initial takeoff, they formed in a line on the bottom groove of the track, which had the most speed for the majority of the race, especially on restarts. Once the Stewart-Haas drivers drafted together, none of the drivers had anything for them through the whole segment. There were no lead changes and the top-4 cars finished in the order they started. Other than Paul Menard, driver of the No. 21 Menards Home Improvement Ford for Wood Brothers Racing, and Martin Truex Jr, driver of the No. 78 Bass Pro Shops/ 5-Hour Energy Toyota for Furniture Row Racing, having car troubles and one single car spin the Stage 1 was incident-free. Blaney won the race off of pit road to start Stage 2 and momentarily held the lead from the Stewart-Haas cars until Jimmie Johnson, driver of the No. 48 Lowes For Pros Chevrolet for Hendrick Motorsports, spun bringing out the caution. During a second round of pit stops, Harvick took the lead with his three teammates right behind him putting the four Stewart-Haas cars out front again. Then on laps 68-70, for the first time in the race, Stewart-Haas Racing looked like it might have some competition when a charge from the outside groove lead by the Joe Gibbs Racing drivers brought the pack two-wide. Kyle Busch, driver of the No. 18 M&M’s Toyota, had an opportunity to attempt to pass the Fords, but didn’t take it and instead stuck with his teammate in the high lane. Busch dropped to the back as he struggled with handling and stayed there for the remainder of the race. Playoff contender Martin Truex Jr. continued to struggle through the second segment with undetermined car issues keeping him behind the pack. Things started to pick up for Kyle Larson, driver of the No. 42 Credit One Racing Chevrolet for Chip Ganassi Racing, as he worked his way through the field after starting in back and qualifying poorly until he had a tire blow on lap 105 causing him to spin and obtain right front fender damage. Toward the end of the segment, the Penske drivers, led by Logano, tried to challenge the Stewart-Haas cars, but couldn’t find the speed and the Stewart-Haas drivers again finished in the top-4 positions with Harvick taking the stage win. All three Penske cars ended up in the top 10. Although the race had been fairly calm early on, the final segment of the 1000Bulbs.com 500 brought the level of intensity and chaos up a notch. Pit strategy left the Stewart-Haas drivers further back in the pack for the first time in the race leaving the rest of the field competing with each other for the lead. Starting the stage, teammates were separated leaving more uncertainty in the restart. After William Byron, driver of the No. 24 Hertz Chevrolet for Hendrick Motorsports, led the first few laps, the Team Penske cars prevailed taking the lead. It only took ten laps for the Stewart-Haas cars to get back up to front, but Keselowski held onto the first position until Jamie McMurray, driver of the No. 1 car for Chip Ganassi Racing, blew a tire on lap 137, an incident similar to the one his teammate Larson had, bringing out the caution. On the restart, almost instantaneously, the Stewart-Haas drivers claimed the top three positions with only Bowyer still battling back to the front. The teamwork of the Stewart-Haas drivers was unstoppable even with a caution coming out late on lap 161 and 187 for an uncontrolled tire and a five car accident involving Hendrick Motorsports’ two playoff contenders, Alex Bowman driver of the No. 88 Nationwide Chevrolet, and Chase Elliott, driver of the No. 9 Napa Nightvision Lamps Chevrolet. Plaguing the leaders late wasn’t so much a wreck, but more the fact that most of them were low on fuel. Two of the Stewart-Haas cars and two of the Penske cars, all running in the top ten and competing for the championship, ran out in the final laps leaving the lead to their teammates Almirola, Bowyer and Logano on the final restart. After staying in his place in the first two stages, Almirola was finally able to take the lead on the last lap and win. Behind the leaders, several cars collided sending Elliott and Kyle Busch to the infield care center, but the caution flag didn’t fly. This was a very uncharacteristic race for Talladega. It was surprising to see the ability of one team to have such influence at a restrictor-plate track, which usually equalizes the field. All the drivers were extremely committed to teamwork throughout the 1000Bulbs.com 500, but none could make it work like Stewart-Haas Racing, who seemed to be the most prepared going into the race. With Almirola and Elliott locked into the next round of the playoffs through wins and Harvick, Kyle Busch and Logano with large enough point leads to advance if they start next week’s race at Kansas, only three positions remain up for grabs going into the Round of 8. 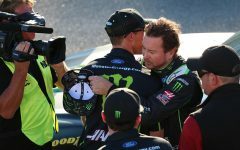 In the sixth position, sits Kurt Busch with a 30-point cushion over the cutoff, who dominated Talladega’s race until running out of fuel on the final lap. With a lead this large it would take trouble early in next week’s race to eliminate Kurt Busch. Behind him is Bowyer with a comfortable 21-point lead on the cutoff, and then Truex Jr. who sits on the bubble with an 18-point lead after struggling at Talladega. Penske teammates, Keselowski and Blaney, are the first drivers below the cutoff with negative 18 and 22 points, respectively. Chevrolet drivers Larson and Bowman are in the worst two positions. Larson is 26 points out after struggling to find speed in Sunday’s race. 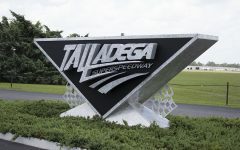 Bowman is a whopping 68 points out in a must-win situation, after coming into Talladega 34 points below the cutoff and being involved in a wreck. Dawsonville native, Elliott, began what looked like would be a good run at Talladega with a seventh place finish in the first stage of the race. His luck started to change for the worse when he ran out of fuel forcing him to pit early and pick up a penalty sending him in the back. Elliott worked his way back into the to the top 10 before being involved in an incident with teammate Bowman. Once back on the track, Elliott was caught up in a last lap collision sending him into the interior wall and ending his day in the infield care center with a 31st place finish on the day. Luckily for Elliott, he’s already locked into the next round of the playoffs. Fellow Georgia driver, David Ragan, driver of the 1000Bulbs.com Ford for Front Row Motorsports, had a bad start to the day leading to just as bad of a finish. On the first lap of the race, Ragan had no power and couldn’t get up to speed sending him immediately behind the wall and into the garage. Ragan ended the race in 39th after his crew spent 20 laps diagnosing and fixing the problem. This was the first time in the last four races Ragan had finished outside the top 10. NASCAR Monster Energy Cup Series drivers hit the track at Kansas Speedway next weekend for a crucial playoff elimination race. Fans can tune into NBC at 2:20 pm EDT to catch the action.